Anyone who plays sports, sweats – and those who sweat, lose fluids and minerals. In sporting activities under an hour which do not require rigorous movements, some swigs from the water bottle may suffice to rehydrate the sportsperson. Those participating in even more physically demanding sports such as rugby, football, basketball or athletics may need more than just water. Specially formulated drinks have been made to meet the needs of sports people who need to be both adequately hydrated and re-energised. These “sports drinks” are usually isotonic in nature as they provide a sort of “premium gasoline” effect, ensuring that the fluid and sodium required is absorbed into the blood quickly. These special sports drinks are mixed with simple carbohydrates and enriched with minerals, trace elements and vitamins. The concentration of the ingredients is the only way of distinguishing between them. 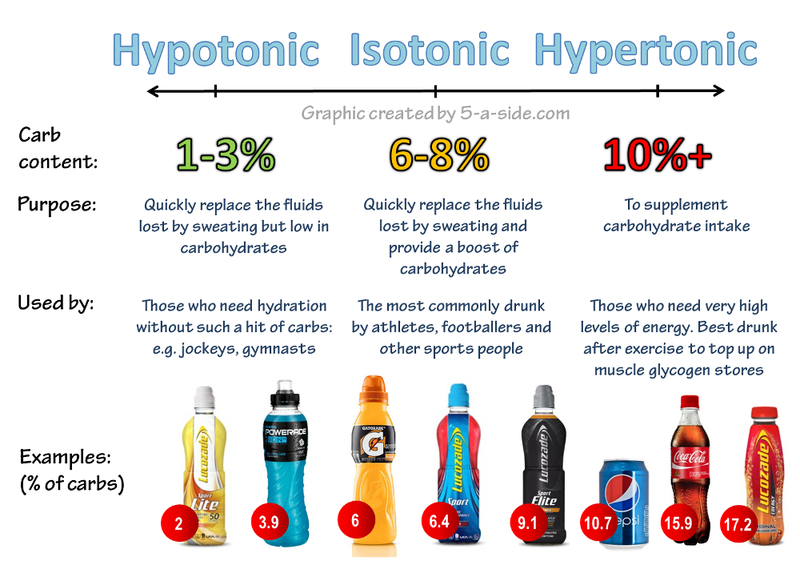 The three available types of sports drinks include isotonic, hypertonic and hypotonic. Isotonic refers to a fluid which has the same concentration of dissolved particles as has the blood plasma. Hypertonic refers to a liquid with a higher concentration than is in the blood plasma. It is slowly absorbed, since it must first be diluted by the body. Hypotonic refers to a liquid having a lower concentration of solutes than the blood plasma. Which sports drinks are best? For maximum utilization of water absorption in the intestine, a sports drink should be isotonic or slightly hypotonic be. In addition, there should be a carbohydrate concentration of 6-8% along with some sodium to replenish the lost electrolytes. Isotonic drinks are the most widely utilised sports drinks and are regular taken by athletes and football players. This is due to the fluids striking a good balance between adequately hydrating and replacing electrolytes lost through sweat, and also providing some energy through carbohydrates to top of the depleting glycogen stores. Due to the low calorie content in hypotonic drinks, they are not really suitable for long haul sports such as marathons or rowing, but are highly recommended for those who just require hydration without a carb boost such as gymnasts, jockeys or even for training sessions at the gym. Hypertonic sports drinks on the other hand are often taken by those who require a high amount of energy over a prolonged period of time. They are often taken in conjunction with isotonic drinks to provide adequate hydration and long lasting energy especially for distance runners. Due to its molecular structure also, it can also be very useful to drink hypertonic drinks after an intense session or match to top up the glycogen stores. In sports, the fluid intake is of particular importance. Physically demanding movement usually results in loss of fluid, whereby sweating increases and rapid breathing occurs. Depending on the exercise load, this can result in varying fluid losses(see table below). The optimal drinking temperature for rapid gastric passage is 5-10 ° C, which is why it is often recommended when dehydrated to have a ‘cool’ or ‘chilled’ drink. Carbonated beverages should be avoided because of the risk of ‘stitches’. Recreational athletes who play three times a week an hour or two sports, involves taking a sports drink, as opposed to professional athletes no benefits. If you are unable to buy a sports drink or need something quickly for a sporting activity, it is very easy to create your own homemade sports drink, with all the benefits of the labelled versions. All that is required is water, salt and a concentrated version of a orange juice or apple squash. • A pinch of salt (1g). • Mix all the ingredients together and keep chilled. • Sports drinks, electrolyte drinks and ISO drinks are mixtures of water, carbohydrates and minerals. • Isotonic sports drinks have an osmotic pressure corresponding to that of human blood, which is why they can be absorbed directly by the small intestine. • Electrolytes serve various functions in the body, as many are essential minerals, these then help to control osmosis of water between the muscles and organs in the body; they also help to maintain the acid-base balance required for normal cellular activities. • In short term exercises and sports are most suited to sodium-rich electrolyte drinks, while sports drinks for marathon runners usually have more carbohydrates. • Sport beverage additives such as proteins and vitamins are generally unnecessary. • By mixing apple or orange juice and a sodium-containing mineral water, a sport drink can be made without having to buy one.